Vietti’s Riserva’s are at the very pinnacle of all Barolo. Enough said! Vietti’s Riserva ‘Villero’ is not made every year. Like all Barolo Riserva’s it is matured for a few extra years before release. Each release being celebrated with a unique artist label just like the wines of Château Mouton-Rothschild. The ’09 Villero features another striking artwork as the label, this time by Anton Fuchs of Köln, Germany. This is the very pinnacle of Vietti’s incredible brace of wines! The 2009’s I’ve had across Barolo and Barbaresco from quality produces have been stunning. 2 weeks ago I devoured a Produttori Rabajà, a week ago Capellano’s Pei Francesco, last year Bartolo Mascarello’s Barolo. All were exceptional. 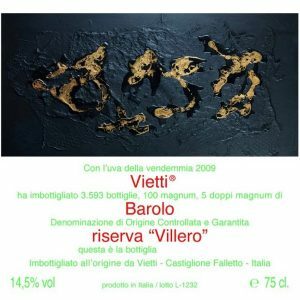 In 2017 Vietti are releasing just the 11th vintage of their Barolo Riserva Villero from the 2009 vintage, with the label another striking work of art, this time by Anton Fuchs of Köln, Germany. Villero is a large Cru within the Commune of Castiglione Falletto, which is noted for the structure and excellence of its Nebbiolo wines (22.07 Ha with 93% planted to Nebbiolo) divided amongst 10 producers and all uniformly exposed south/south-west at around 250 to 350 metres above sea level on white and blue marl soils typical to the Commune. 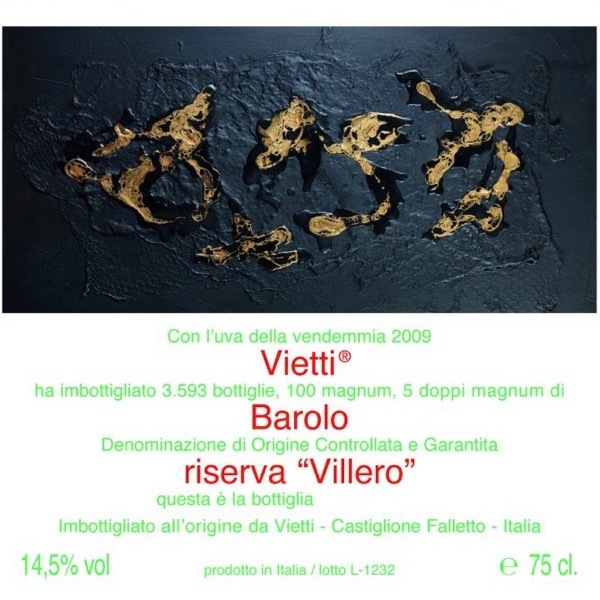 Vietti have a long held tradition of specially-designed original art works as labels. Initially in 1974 Luca’s parents Alfredo Currado and Luciana Vietti engaged specific artists for several of their wines, however since the presentation of the 1982 Barolo Villero in 1988, this practice has been reserved exclusively for the Barolo Riserva Villero. The print run is the same as the number of bottles produced, and the first hundred labels are signed by the artist. Each work is only used once, just for the wine of that vintage. *We will only receive a few bottles of the Riserva. Following allocation, in early November you will be invoiced for 50% of the total. The balance payable when the wines are ready to ship in December. This is Epic so no quantity pricing I'll be lucky to get a few bottle. As usual we price it to look after our Wine Decoded Peeps! Vineyard Located: within the village of Castiglione Falletto, the Villero vineyard faces South/South-west and covers an area of a little less than one hectare. The vines are 41 years of age on average and are planted at a density of 4,000 per hectare. The 2009 vintage was harvested on September 25th, and yielded around 35 hectoliters of wine per hectare. Soil: Moderately clay and compact, with evident white and blue marlstone. Winemaking: After alcoholic fermentation in steel tanks lasting 24 days at a temperature of between 28 and 32 degrees Celsius, the wine macerated on the skins for a total of 16 days. It was then transferred immediately into small barrels for malolactic fermentation and into bigger oak casks for further aging. It was bottled without filtration on July 12th, 2012. Total production for the 2009 vintage was 3,593 standard bottles, 100 magnums, 5 double magnums. Total production: for the 2009 vintage was 3,593 standard bottles, 100 magnums, 5 double magnums.